Say the name Jake Ryan at dinner party of Gen X-ers and see what happens. I'll bet my Manolos that the men will stare blankly--perhaps thinking the name is someone they may have graduated with or a kid on their son's soccer team. And every woman there will swoon with instant recognition. The plaid shirt, make a wish Samantha--it already came true--swoon. The epicenter of John Hughes' classic film Sixteen Candles. We still love Jake Ryan because he was the popular, coveted guy who was as gorgeous on the inside as his chiseled jawline. I'll always love that he chooses authenticity over the hollow veneers of adolescence. Cheering for the unsung and substantive Samantha Baker never gets old. As much as I love glitter and flash, I'll take substance over style any day. Lucky for us, Jake Ryan will always have both. 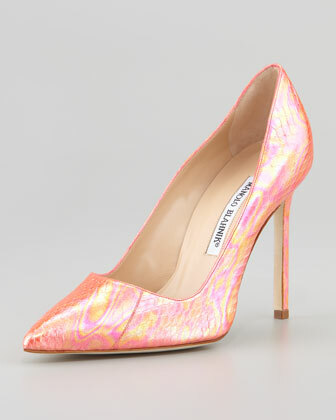 Manolo Blahnik BB Holographic Pump. Just add A Flock of Seagulls.